How Much Would It Cost Walmart to Pay Its Employees More? Yasmine Mahmoud | Spartan Daily Verbena Lea of Eureka, Calif., speaks at an event Tuesday about raising the minimum wage in cities across the state. The press conference was held in honor of the first anniversary of the $10 minimum wage in San Jose. The San Jose State Campus Alliance for Economic Justice (CAFE J) held a press conference Tuesday at noon to discuss the impact of the minimum wage increase in San Jose. CAFE J celebrated the one-year anniversary of the implementation of the $10 minimum wage in San Jose. 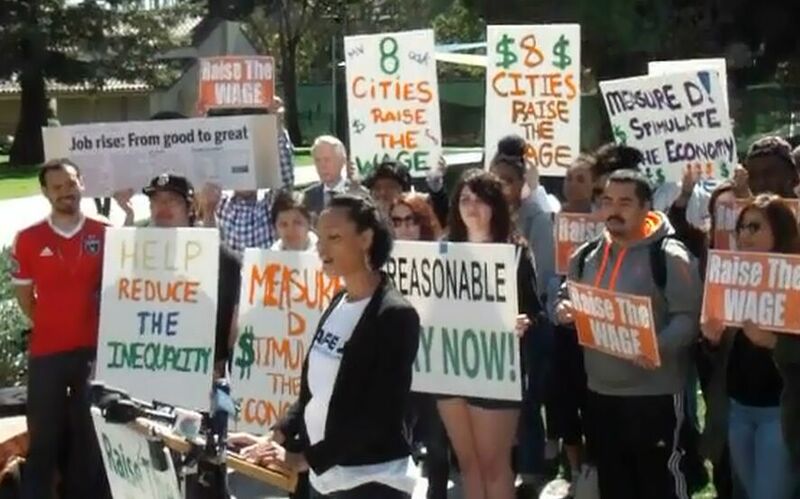 Leaders from six Calif. cities spoke about why they are leading efforts to raise the minimum wage in their cities. Melissa Mejia, a member of CAFE J and Mountain View native helped coordinate the event. “It’s important how… we were able to do something on a huge level just for San Jose, and if we can get to to citywide and even to statewide, it would be a good thing,” she said. Verbena Lea, a proponent of the Eureka Fair Wage act, traveled from Eureka to attend the conference. “We at the podium were really inspired by the San Jose State sociology class that essentially campaigned, wrote the whole Measure D that got passed here with more help from people in the community,” Lea said. 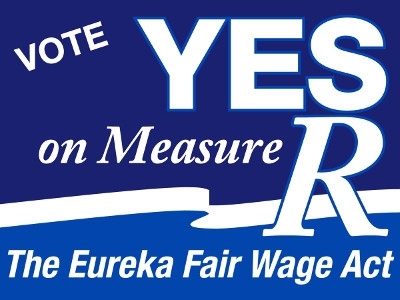 The Eureka Fair Wage Act, which [will raise -ED] raised the minimum wage from $8 to $12, was modeled after San Jose’s Measure D, Lea said. Bernie Goldsmith, co-chair of the Raise the Wage Davis campaign, spoke at the event to thank San Jose for its original effort of championing minimum wage increases. “The people who spoke before me were evidence that the work done in San Jose was being watched by the world,” Goldsmith said. Minimum wage movement representatives from Berkeley, Davis, Eureka, Mountain View, Richmond, Oakland, San Francisco and Sunnyvale attended and/or spoke at the event.